The mission of the Arlen Specter Center for Public Service at Jefferson (Philadelphia University + Thomas Jefferson University) is to facilitate and promote public service and civic education in a cross-disciplinary, nonpartisan setting. The work of the Center will include programming inspired by Senator Specter’s long-term interests and accomplishments. In collaboration with the University of Pittsburgh, the Center will preserve, organize and provide access to Senator Specter’s historic archive of papers, photographs and political documents for the benefit of researchers and scholars and the public. On October 19, 2018, the Specter Center celebrated the completion of the Arlen Specter research website, which includes a finding aid to the late Senator’s full collection of papers and links to a subset of the collection which has been digitized in full text. Ashley Taylor, University of Pittsburgh’s Specter archivist, discussed the process of indexing the collection, a major contribution to American political history, and she gave attendees a virtual tour of the new Specter website and finding aid. The event also marked the official unveiling of Jefferson’s own Senate Office Replica, complete with signed photos and memorabilia, a facsimile of Specter’s Senate desk, and carpet designed by, Robin Althouse, a Jefferson masters in textile design student. View the Specter Senatorial Papers website here. Join us for a discussion about the inspiring story of two nurses at the frontlines of the AIDs outbreak in New York City in the 1980s. Both Matzer and Hughes noticed a growing number of young men with a peculiar immune deficiency entering their ICUs. Although it would be years before anyone understood what was happening, it became the main focus of their careers. The empathy and compassion of Matzer and Hughes deeply affected their patients’ lives. This is the book about that experience. Online streaming of the event will be available through Facebook Live. 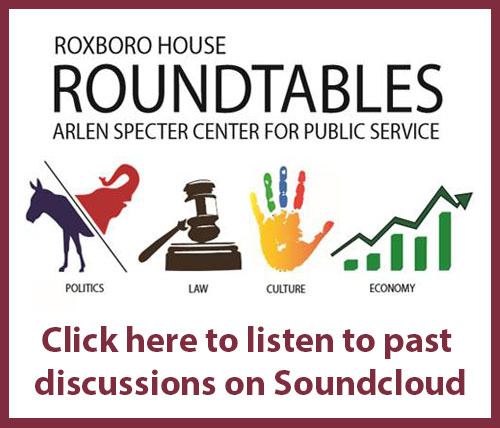 Hosted by Maiken Scott of "The Pulse" on WHYY, the Arlen Specter Center hosted a panel discussion focusing on the issue of suicide prevention for college students and associated mental health issues. The University’s Arlen Specter Center for Public Service has awarded four $5,000 fellowships to promote scholarship and research in an area supported by the Arlen Specter Collection. “These fellowships will highlight and raise awareness of the significant impact the late senator’s work had on American politics, criminal justice, healthcare policy and culture, thereby advancing the profile of the Center and University,” said Evan Laine, director of the law and society program at Jefferson (Philadelphia University + Thomas Jefferson University). The Daniel Gerstein Award is an annual essay contest given to students who demonstrate excellence in their ability to navigate a profound experience of grief/loss.